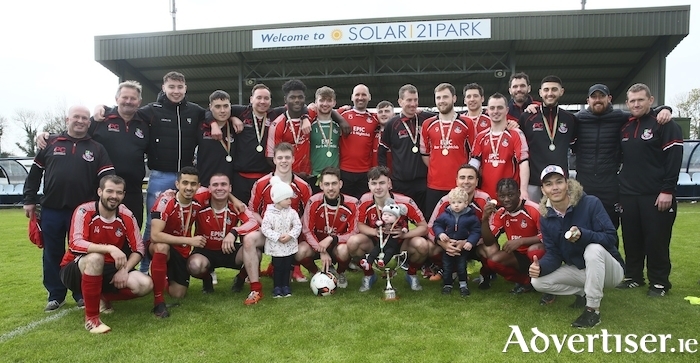 Winning time: Ballyhaunis Town celebrate winning the Premier Cup last Sunday in Solar 21 Park. The battle to avoid the drop to the Premier Division has gone right down to the wire this season. On Sunday, Ballyheane will host Kiltimagh/Knock United in Quigley Park at 2.30pm, with the loser to fall through the trap door alongside the already relegated Iorras Aontaithe. When the two sides met in the league earlier this season in east Mayo, Kiltimagh-Knock United were the winners by the odd goal in three, with Brian Morley and Liam Groake getting the goals for the home side, while Sean Tuffy responded for the visitors that day. Both sides have won just four of their 17 league games to date, with Ballyheane seeing off Iorras Aontaithe, Westport United, Manulla and Claremorris - while Kiltimagh/Knock United have beaten Iorras Aontaithe twice, Castlebar Celtic and their opponents this weekend, Ballyheane, in round five back in May. At the top of the table, Ballina Town already have the title wrapped up for a number of weeks now and will round off their league season with a trip to Carramore to take on Manulla. Westport United currently sit in second place, three points ahead of Castlebar Celtic and Claremorris, and they will wrap up their Super League campaign with a visit from Ballyglass - while the aforementioned two sides will face off in Concannon Park. The final game in the top flight is the meeting of Straide and Foxford United and Iorras Aontaithe in Green Road on Sunday afternoon. The battle to claim the Premier League title will go right down to the wire on Sunday afternoon, with both Snugboro United and Ballyhaunis Town battling it out for the title. Both sides have already been promoted to the top flight for next season and heading into the final round of league games, the Conway Park outfit hold a slender one point lead. They face an already relegated Westport United B team at home on Sunday and while this should be a relatively simple win for Aaron Curry's men, they have lost four of their last five games in league and cup action - the most recent being last weekend's Premier Cup final - to the side right on their heels in the race for the league title - Ballyhaunis Town. The east Mayo outfit won 5-4 on penalties after the game finished 1-1 after extra time in Solar 21 Park in Milebush; the cup winners will be away to Bangor Hibs on Sunday morning - hoping for a slip-up from the 'Boro in their game to pick up the title.